A few months ago, my church put out an announcement that the ministry school they sponsor was drastcially low on certian items that are vital to thier pantry. They put out a list of all of the things that were needed and I immediately challenged myself to help in any way I could. I had just started grocery hounding and getting great deals but I thought “I want to send as much as I can but we are still empty in our own pantry. How am I going to do it?” Then, it happened. The next 3 weeks consisted of phenominal sales at the grocery stores and I just happened to have coupons for about 75% of what was on sale. So, there were quite a few FREE items that I was able to pick up! 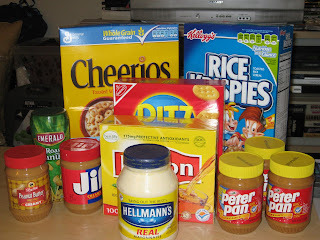 And of course, most of those free items were on the list of needed items for the church pantry! I have dropped of 2 big loads of groceries to them, filling up many bags(the loot above filled up about 3 bags), and I still have a full pantry…actually, its bursting at the seams right now. Yes, when it rains it pours.